Well, at least the basic version is free. Go to vennage.com to sign up. They have a lot of basic templates for charts and a decent selection of infographic templates as well. For $19.95 per month, you get a few more templates, in particular, a map of the U.S. that allows you to display data for each state, plus the ability to publish your graphic as a pdf file. Of course, with the free version you can just do a screen grab and embed that. With the free version, you can only have five infographics live at a time, which might crimp your style for regular usage, but isn’t an issue for occasional work. 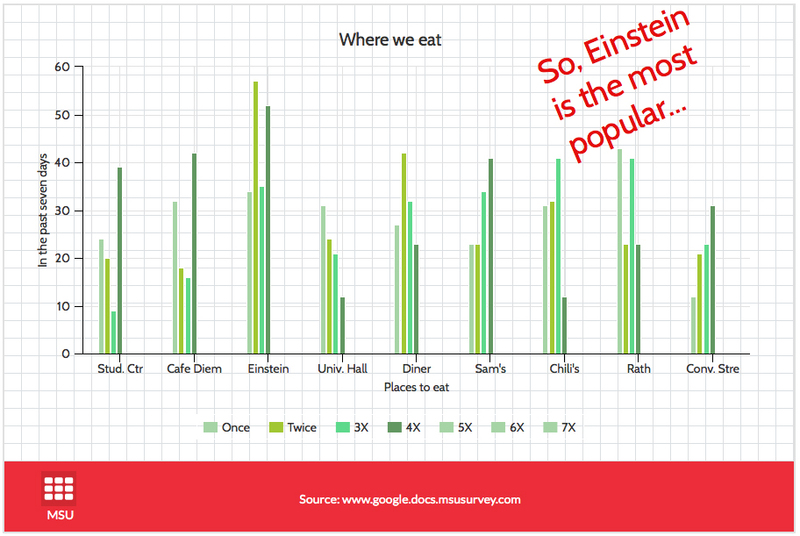 The graphic above is one I created for a class, using some data from a Google Forms survey asking students where they ate on campus in the previous week. Every part of the template is customizable, generally by clicking on the element, which opens up a panel. If you’ve discovered a better free or inexpensive tool for creating charts and infographics, let me know.